Join NMTC as we all go on a Summer Holiday! Our big red bus will be stopping at the Cripps Hall Theatre, NSB from Wednesday 31st May to Saturday 3rd June 2017. We will be returning to the Cripps Hall Theatre to perform this new musical, featuring all of the hit songs from the classic, Cliff Richard, 1963 movie, including In The Country, Bachelor Boy, Living Doll and of course, Summer Holiday, as well as many more! The production will be directed by our regular professional director, Martyn Knight. Performances are nightly at 7:30pm Wednesday to Saturday, with a Matinee at 2:30pm on Saturday. During a miserable wet British Summer, garage mechanic Don persuades London Transport to loan him and his friends a double-decker bus for a trial run of a proposed travel service across Europe. Don and his mates transform the bus into a hotel on wheels for their holiday road trip. In France they hook-up with an all-female musical trio ‘Do-Re-Mi’ and after discovering that their car is knackered, the boys offer to drive the girls to Athens. But when a boy stows away on board the bus the whole scenario changes, especially when they discover the ‘boy’ is actually a runaway girl – the beautiful American pop star, Barbara! Don and Barbara are soon in love. Barbara just wants a vacation to relax from her taxing schedule and pushy, rather overbearing Mother. But on discovering Barbara’s whereabouts, her Mother and Agent (Jerry) pursue the kids, and, for a publicity stunt, accuse the mechanic of abducting her daughter! Local theatre group perform county premier of the musical inspired by a local family’s adventures. The first show in NMTC’s busy 2017 season is the new musical, Summer Holiday, based on the 1963 Cliff Richard movie. Summer Holiday the musical follows the same story as the film. Don persuades London Transport to loan him and his friends a double-decker bus for a trip across Europe. Don and his mates transform the bus into a hotel on wheels for their holiday road trip. However this story was based on true events, and those events began right here in Northamptonshire! Pete Thorn, NMTC’s Social Manager said, “Once we had gained the rights to the show, we knew there was only one place that we could go for our show photoshoot – Highgate House, the home of the original Big Red Bus”. The original bus was the creation of Michael and Diana Chudley. They converted an AEG Regal coach into a mobile home and took their large family on holidays, including, what was in those days, a real adventure to the USA. This trip was broadcast by the BBC and Gaumont News. 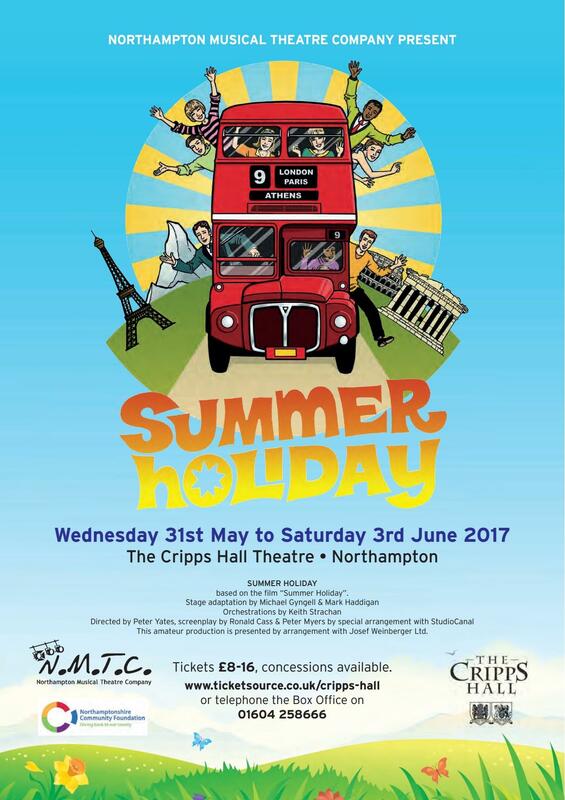 Summer Holiday runs in the Cripps Hall Theatre at the Northampton Boys School from Wednesday 31st May – Saturday 3rdJune 2017, with performances every evening at 7.30pm and a Saturday Matinee at 2.30pm. Tickets are from £10-£16 with discounts available for Groups and Concessions. To book tickets call 01604 258666 or visit www.ticketsource.co.uk/cripps-hall. For more info on NMTC have a look at their website: nmtc.me.uk. The ‘Chudbus’ can be visited at Highgate house throughout the summer season. Don George Johnston A confident, charming young man. A born leader. Edwin Ben Stanton A chirpy over knowledgeable and serious man. Cyril Luke White A jack the lad type character, cheeky and never stuck for an answer. Steve Harvey Morris A stylish fashion conscious lad about time. Always worried about his looks. Alma Hannah Taylor A young vacant, but aware young lady. Mimsie Helen Kennedy A blonde, feisty young girl. She must appear to have an older head on her shoulders. Barbara Winters Katy McNaughtan A young American pop star. Dominated but her doting Mother. Jerry Brett Hanson Barbara’s long suffering agent and business manager who is clearly under the thumb of Stella. He is a middle aged mouse of a man with a penchant for flamboyant clothing. Sandra Katy Batchelor A Waitress at Wilf’s cafe.